Nor is Baghwan’s experience unusual. As the world marks the International Day to End Impunity for Crimes against Journalists on Nov. 2, most cases of violence against media personnel remain uninvestigated. According to UNESCO’s global statistics, in the past decade 700 journalists have been killed, with no convictions in nine out of ten cases. He mentioned some high-profile cases of targeted journalists, including Wali Khan Babar, a 28-year-old reporter, shot dead in January 2011 in Pakistan’s largest city, Karachi; Salem Shahzad, who was found dead in Islamabad in June 2011 after reporting on the infiltration of terrorist groups in the military and Hamid Mir, among Pakistan’s most famous journalists, who survived an attack on his life in Karachi in April 2014. “The Saleem Shahzad commission’s report failed to ensure accountability or even name the perpetrators,” said Ijaz. 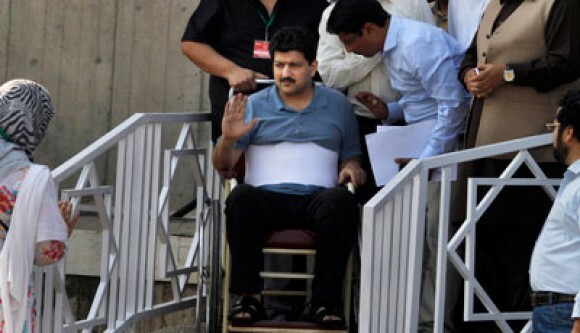 “The Hamid Mir commission report remains pending and the proceedings shrouded in mystery. The witnesses, investigating officers and prosecutor have been assassinated in Wali Khan Babar’s cases. The impunity surrounding the violence against journalists continues unabated,” he said. On CPJ’s Global Impunity Index, Pakistan ranks as the ninth worst country in the world in which journalists are murdered and no one is brought to justice. In terms of violence, the year 2015, however, has been better than previous years. In 2014, according to the International Federation of Journalists, Pakistan was listed as the most dangerous place for media with 14 journalists killed. The accusations leveled by Geo TV against Pakistan’s Inter-Service Intelligence (ISI) led to a temporary ban on the channel. However, the channel disappeared from television screens in most parts of the country even before the ban was officially placed, and remained blocked for most of 2014.